At Portofino Island Resort, we believe plentiful dining and shopping options are just as important as sun, sand and adventure in creating a memorable experience. In fact, the city of Portofino on the coast of Northern Italy is a place where food and wine are a beloved way of life. 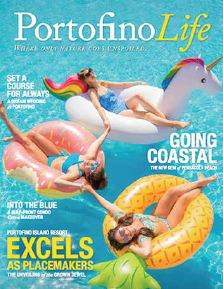 Here at Portofino Island Resort, we also embrace that philosophy and feature some of the best restaurants in Pensacola Beach as well as a diverse array of specialty shops and boutiques. Inspired dining featuring the finest selections of seafood and land fare, Coastal is Portofino Island’s signature restaurant and the area’s premier culinary experience. Its menu is highlighted with the freshest locally-sourced seafood, premium cuts including grass-fed, free-range and organic meats, and chef-curated offerings ranging from regional delicacies and sushi to lifestyle-minded vegetarian options and more. Additionally, Coastal’s wine and cocktail list features select vintages from the leading wine regions around the world with a particular structure toward the accompaniment of the flavors found on the menu, as well as custom craft cocktails and an assortment of craft beers. The restaurant serves breakfast and lunch on Saturday and Sunday. Dinner is served daily with unique ambiances for each meal and service that is unmatched and ever-attentive. Just as its name suggests,Portofino al Fresco, is the resort’s open-air dining venue with an informal ambiance and a menu of fresh selections. Reminiscent of a Tuscan veranda with bubbling fountains and sweeping views, the restaurant serves lunch and dinner daily from its location at the Lifestyle Center overlooking the pool deck and the Santa Rosa Sound. Perfect for the entire family, al Fresco features the Chef’s take on classic regional dishes like Shrimp & Grits, as well as casual favorites including signature salads, burgers, wraps, sandwiches and plenty of kid-friendly entrees. Serving tropical libations and light fare, Cobalt Bar is an active oasis for refreshment at Portofino Island Resort. The bar’s service area encompasses the Lifestyle Center pools, signature firepit tables and soundside along the bay. Its menu includes a range of classic and specialty cocktails including the resort’s signature Portofino Punch and Pensacola Beach’s own Bushwackers along with daily specials and seasonal Happy Hour features. Serving tropical libations and light fare, Gulfside Grille is an active oasis for refreshment at Portofino Island Resort. The bar’s service area encompasses the Portofino's Adventure Beach on the Gulf. Its menu includes a range of classic and specialty cocktails including the resort’s signature Portofino Punch along with Happy Hour specials and light beach bites. A Starbucks, a marketplace and so much more… The Market at Portofino is the ideal stop for guests’ on-the-go needs. Centrally located at the Lifestyle Center, this space offers an interior shopping entry and a poolside takeaway window serving specialty coffees, ice cream and more. Portofino Island souvenirs and logo merchandise can also be found at The Market, along with sundries and select grocery items including alcohol and cold beverages. Sometimes there is nothing better than staying in with the family and enjoying a meal in the amazing skyhomes at the Portofino Island Resort. With Dine-In Delivery, the culinary team has developed a specialized menu of breakfast, lunch and dinner selections that can be ordered-in and delivered directly from the kitchen. Additional services available as part of this offering include the resort’s Wine-to-You program which features a comprehensive selection of wines available for delivery by the bottle or the case, and theChef-To-You program which brings a chef into the skyhome to prepare a customized meal – ideal for romantic evenings, special family events and small dinner parties. Take a little pampering home with you from the Spa Shoppe, featuring the same products used in our spa treatments, plus fun beach accessories and locally crafted jewelry. 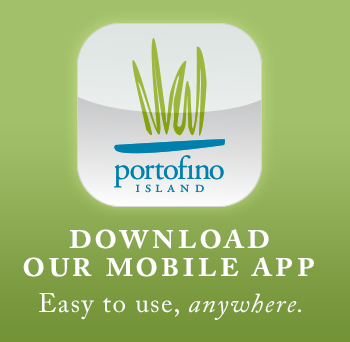 Hop aboard the Portofino I and head to the Portofino Boardwalk for more options, including Lucas' and Envie Boutique . Whatever your taste, Portofino Island Resort offers something for everyone.